Explosive Reactive Armor (ERA) is a type of modern special armor. ERA is formed by using one or multiple layers of high explosive between armor plates. ERA can be manufactured as add-on armor or integrated into the armor of a vehicle. Add-on ERA usually consists of a smaller tiles or boxes, which are attached to the vehicle by bolts. The use of smaller tiles reduces weakspots once the ERA has been detonated. The working mechanism of the most common types of ERA follows a very simple design. A layer of high explosives is sandwiched between two metal plates, together this is forming a reactive element. When being penetrated by a shaped charge jet or another projectile, the high explosives will detonate and propell the two metal plates into opposing directions. This has two effects: more mass (metal) is moved into the path of the projectile and the converse movement of the metal plates will have a disrupting effect on the projectile, shattering the shaped charge jet. To properly work however, the reactive element has to be inclined in relation to the penetration path of the shaped charge jet. Heavy ERA is able to destroy or at least damage modern armor-piercing ammunition like the long-rod penetrators used in APFSDS ammunition. 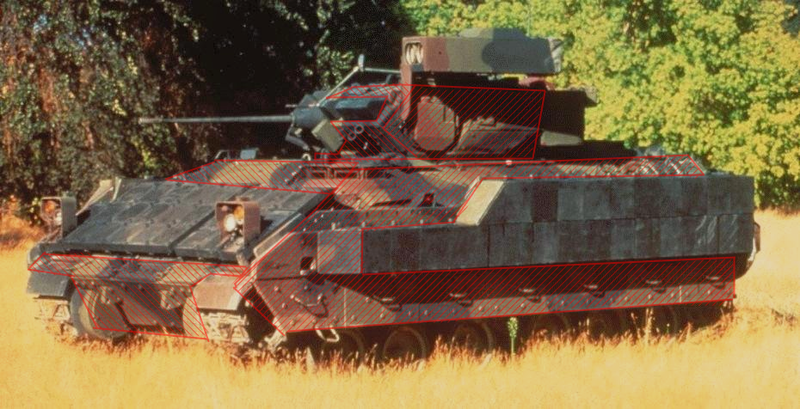 On the drawback of poor coverage of a vehicles surface with ERA, the Swedish FMV came to the conclusion that in case of the T-80U the Kontakt-5 ERA should be considered "50% protection", because only about half of the frontal surface is actually covered by the ERA. According to Russian sources, the Soviets started their earliest research in explosive (reactive) armor in 1949. However the whole Soviet ERA development ended without success or the adoption of any type of ERA, following poor design choices and accidents. The ERA in the form as known today was invented - or popularized in the case one values the fruitless Soviet developments high - by the German researcher Dr. Manfred Held. Dr. Manfred Held traveled to Israel following the Six-Day War. He was an expert for shaped charge warheads and wanted to examine the effects of shaped charges on real Soviet-made tanks, like the ones used by the Arab nations in the Six-Day War. Following his investagions of damaged T-54 and T-55 tanks, he discovered in some cases, the detonation of ammunition has reduced the damaged caused by the shaped charge warhead. 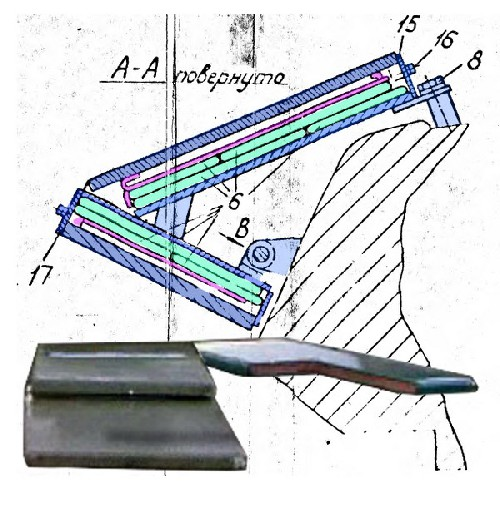 He developed a first type of working ERA and patented it in 1970 (German patent 2053345). This original ERA also provided protection against kinetic energy penetrators like APDS and APFSDS, but was impractical and complicated compared to more modern designs. It was designed as integrated ERA, which required the vehicle to have special cavities into which the reactive element and explosive was inserted. Held then patented (German patent 2008156) a more refined version of ERA in the same year, which happens to be very comparable to modern ERA, consisting of a tile formed by two thin steel plates with an explosive material sandwiched inbetween. While not having any success in persuading Germany or other NATO members to adopt his developments, things changed when Dr. Held came back to Israel in 1974 for further research following the Yom-Kippur War. 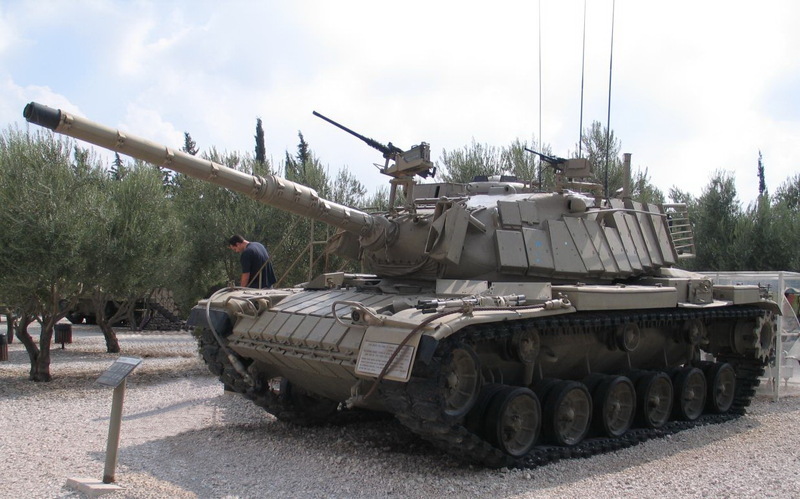 After he presented his invention to a delegation of the IDF, the Israeli government issued Rafael to develop a type of ERA for series production. The first type of explosive reactive armor adopted on a tank was Blazer ERA. Blazer used a rather primitve construction using one reactive element per tile. Each reactive element consisted of a three milimeter steel plate, a three milimeter thick layer of explosives and a further three milimeter thick steel plate. Blazer was first deployed in the Lebanon War of 1982. Cross section of Blazer ERA mounted on a M48 Patton tank. Two reactive elements are bolted onto the steel case. Blazer ERA uses an insensitive explosive filler, which does not detonate upon penetration by small arms and medium caliber ammunition up to 23 mm AP. Upon penetration by a shaped charge jet, the steel plates accelerate to a velocity of approximately 800 meters per second. Blazer ERA could reduce the penetration of an RPG-7 projectile from 300 to about 100 milimeters into steel, although the absolute figures are depending on the angle of impact. However Blazer in it's original form had a number of drawbacks. It provided rather poor coverage on many vehicles (including the M48, M60 and Centurion tanks), leaving unprotected gaps in the layout. Due to using many different shapes of ERA tiles, Blazer was a logistical burden compared to other types of ERA. The Slovenian M-55 upgrade used (Super Blazer) ERA for protection. Blazer has been succeded by the Super Blazer ERA in the 1990s/2000s. Aside from being more effective than it's predecessor, Super Blazer also offers some amount of protection against kinetic energy penetrators and is not being initiated by KE ammunitions up to 23 mm AP and fragments from artillery and mortar rounds detonating as close as 2 metres away. The Soviet Union was the second country to adopt explosive reactive armor in form of their Kontakt ERA, which was first introduced in 1984. In most forms Kontakt ERA uses two reactive elements, although there might have been versions with just one reactive element. The reactive elements are located in rather small boxes (314 x 148 mm base area) with three milimeter thick steel walls. The reactive sandwich with the designation 4S20 consists of a 2 mm thick steel plate, a 7 mm thick explosive and a 2 mm thick steel plate. A Kontakt ERA tile with two reactive sandwich plates has a weight of 5.7 kilograms without attachment bolts. About 151 tiles are used for a tank (although the number varies depending on tank type and surface area). Kontakt-1 ERA tile showing the arrangement of the two elements. Just like Blazer, the original Kontakt ERA did not provide any protection against armor-piercing ammunition and used insensitve explosives in order to prevent the detonation by small arms fire. According to Russian sources, Kontakt ERA provides protection equivalent to up to 400 mm rolled steel armor (RHA) when hit by single-stage shaped charge warheads. Unlike Blazer, Kontakt provides protection at a greater amount of angles, because of the use of two reactive elements aligned at different angles. The smaller size of the Kontakt tiles is also favorable. 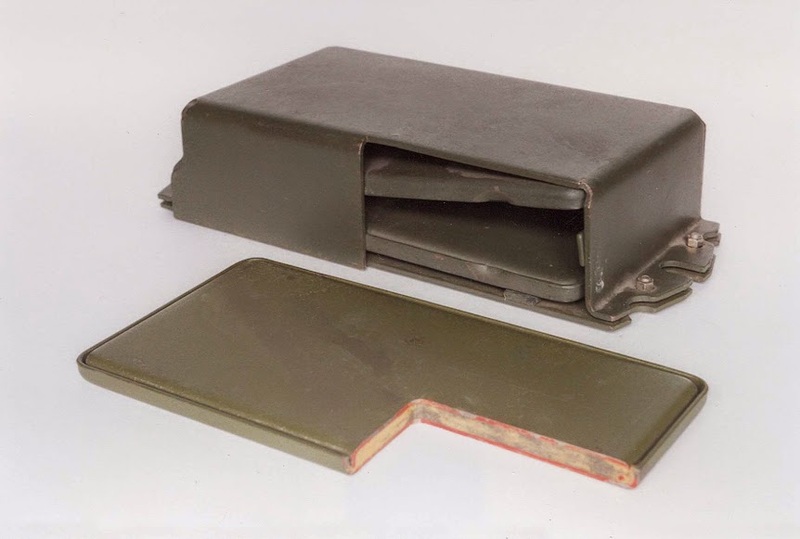 Kontakt-5 was the Soviet follow-up development to the original Kontakt ERA, which was designed to also provide protection against armor-piercing ammunition. Unlike the previous generation of Kontakt ERA, Kontakt-5 was considered "integrated ERA" by the Soviets, because of the mounting mechanism and the. Kontakt-5 is a type of heavy ERA. Kontakt-5 uses a heavy steel shell, into which the 4S22 reactive element is inserted. Depending on where the tile is used, one or two reactive elements are installed. The 4S22 reactive elements are using more powerful explosive fillers with a TNT equivalency of 0.33 kilograms compared to the 0.28 kilograms of the earlier 4S20 reactive element of Kontakt-1. Nii Stali claims that Kontakt 5 ERA provides protection equivalent to 400-500 mm steel against RPGs and ATGMs, 200-250 mm steel against HEAT tank and artillery ammunition, and reduces the penetration of APFSDS by 20%. This is said to increase the armor protection of the T-72B by factors 1.2 against APFSDS and 1.9-2.0 against shaped charges. Nii Stali also claimed that a T-55 eqiupped with Kontakt-5 ERA is able to resist APFSDS ammunition with up to 400 mm penetration. Kontakt-5 provides protection against APFSDS by using a combination of more powerful explosives charges and thick coverplates - this results in shattering of the penetrator or bending of the rod. However more modern types of APFSDS can defeat Kontakt-5 ERA without being destroyed or strongly deformed. The DYNA reactive armor was developed 1988 by the Czech military repair facility in Novy Jicin together with the military technical institue of Slavicin. Unlike the previous mentioned types of reactive armor, DYNA does not use reactive elements formed by simple steel plates with explosives sandwiched inbetween, but rather uses rhombus shaped elements (◊). These consist of a thin-walled hollow steel rhombus which is coated with a layer of explosives. The explosvies are covered by another thin steel layer. According to figures from the Czech military, when mounted onto a T-72M1 the protection is increased to 1.3 times the original protection against APFSDS, and to 2.2 to 2.7 times the original protection against RPGs and missiles. The construction of the DYNA reactive armor used for protection the tank's roof and hull might be different, at least the thickness of the used ERA modules is different. Nozh and Duplet reactive armor have been developed in the Ukraine. 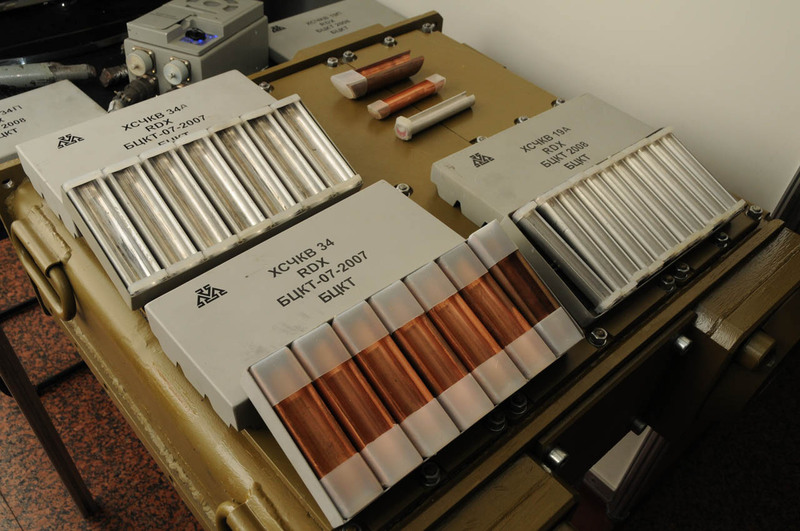 Instead of just using explosive materials sandwiched between simple steel plates, the Ukrainian engineers decided on using several linear shaped charges (LCS). The LCSs consist of either copper or aluminium and have a classic "half moon" shape [☾]. In the hollow center section, high explosives are inserted. Upon penetration, the explisve filler of the linear shaped charges will detonate and accelerate the liner material. This will form a shaped charge jet (or rather a bar), just like in a convential shaped charge as used on HEAT warheads. Different reactive elements for Nozh and Duplet ERA. Unlike many other types of ERA, the Duplet ERA consist of many different layers ontop of each other, the space between the different ERA layers is partly covered by solid steel elements. In case of the T-84M Oplot-M main battle tank, there are up to three layers of Duplet ERA at the turret and the hull sides, whereas the glacis armor utilizes only two layers. As a result of Duplets multi-layer design - consisting of up to three reactive armor tiles sandwiched spaced by rather heavy, solid blocks of steel - Duplet ERA cannot be utilized on small and lightweight vehicles.Per square metre Duplet ERA weighs between 400 and 500 kilograms. According to figures provided by the Ukranian manufacturer, Nozh and Duplet provide between 1.5 and 2.5 times as much protection as the "best world analogues" like Kontakt-5 and Blazer. Other, even more questionable figures from Ukranian sources claim that Duplet can reduce the penetration of unknown types of single stage shaped charge, tandem shape charge warheads and APFSDS by up to 90%. These values are most likely propganda or based on completely obsolete ammunition - the combat performance of Ukranian T-64 and T-72 tanks has been rather poor, despite using Nozh ERA. The Polish ERAWA reactive armor is designed for extended coverage of the tank's suface in comparision with other ERA solutions. The tiles are quadratic and smaller than those of the previously mentioned ERA types. This means that ERAWA ERA tiles can be fitted to a tank nearly "seamless". ERAWA-2 is a multilayer ERA version of ERAWA, using two reactive elements in one tile. This provides higher protection against shaped charge warheads with a precursor charge or tandem warhead. It also offers some degree of protection against explosviely formed penetrators (EFPs) and APFSDS, however only against older types. The tiles of both ERAWA and ERAWA-2 have a size of 150 x 150 militmetres. ERAWA has a thickness of 26 mm and weighs 2.9 kg. It contains of one single but rather thick reactive element consisting of steel plates and explosive located inside a steel casette mounted on bolts. The multilayer ERAWA-2 ERA utilizes a thicker tile of 46 mm containing two reactive elements. The coverplate is thicker and might include a non-metallic composite content. This leads to a weight of 4.7 kg per tile. CERAWA is a prototype type of ERA based on ERAWA, but designed to incorporate a ceramic tile into the reactive element instead of mainly relying on metalic materials like steel. The reactive element still contains a certain amount of steel though and is also making use of rubber in some applications. CERAWA provides protection against classic (small) RPGs, which have a penetration into steel in the range of 300 milimetres, and 14.5 mm armor-piercing ammunition when fitted to a BMP-1. Unlike other types of ERA, CERAWA does not require a large amount of base armor: in Polish trials, a 10 mm steel plate was neither penetrated by a RPG-7 nor by the CERAWA explosive reactive armor protecting it. Switzerland's RUAG has developed SidePRO-CE, which is a composite explosive reactive armor design. The focus for SidePRO-CE was put on lower collateral damage. 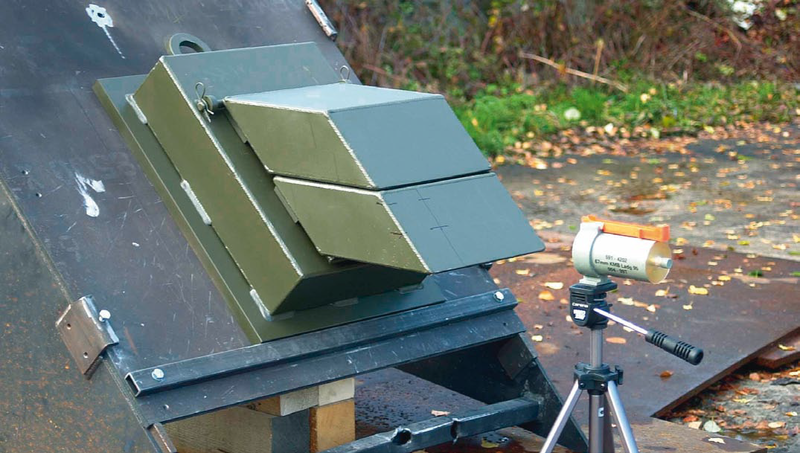 SidePRO-CE does provide protection against HEAT ammunition such as RPGs (incl. tandem shaped charge warheads) and kinetic energy ammunition. SidePRO-CE ERA being tested against a HEAT warhead. CLARA (Composite Lightweight Adaptable Reactive Armour) is a German composite reactive armor, which has been developed by Dynamit Nobel Defence (a company that traces back it's origin to Alfred Nobel, aka "that guy from the Nobel prize" and inventor of the dynamite). Unlike other types of ERA, CLARA is designed to be fragmentation free. This is achieved by using a composite fibre material instead of metal or ceramic plates for the reactive elements. Depending on version CLARA has an areal density of 70 kilograms per metre to 270 kilograms per metre. It provides protection against single stage shaped charges (as used on most RPGs), EFPs and in case of the heavy version against kinetic energy penetrators up to 30 mm APFSDS. CLARA was originally developed for the Dutch-German Fennek scout car deployed in Afghanistan, but it was never adopted on the Fennek due to weight concerns and changes in priorities. 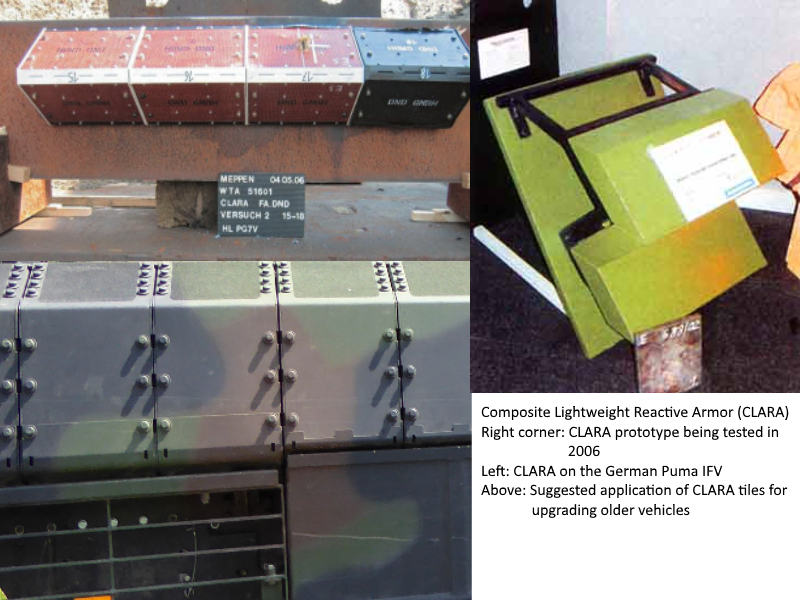 After being successfully trialed on the Marder infantry fighting vehicle (IFV), CLARA is being used to protect the German Puma IFV in certain areas. In this configuration, each ERA tile has a weight of about 40 kilograms. It has also been tested on the Boxer APC. According to Dynamit Nobel Defence CLARA offers a tenfold increase in protection per weight compared to "traditional passive armor", the latter is understood to be steel armor. thank you very much for this article, it is great and very interesting. However, everybody knows that Tandem-HEAT was designed to overcome the first ERA models. Now I often read that modern ERA can maintain some effectiveness against Tandem-HEAT and APFSDS designed to overcome ERA like the russian K-5. So I am very curious and intrigued on how it supposed to be done. It would be awesome if you could write an article on that topic. Thank you Don Juan, I actually have the same question about the effectiveness of tandem-HEAT deal with various type of ERA & NERA.